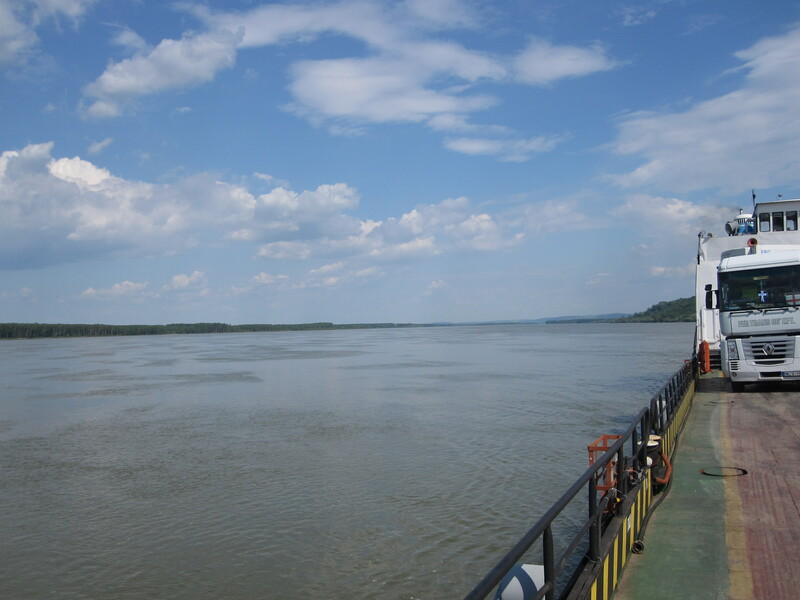 « Cycling the Lower Danube. Euro Velo 6. Day 6. 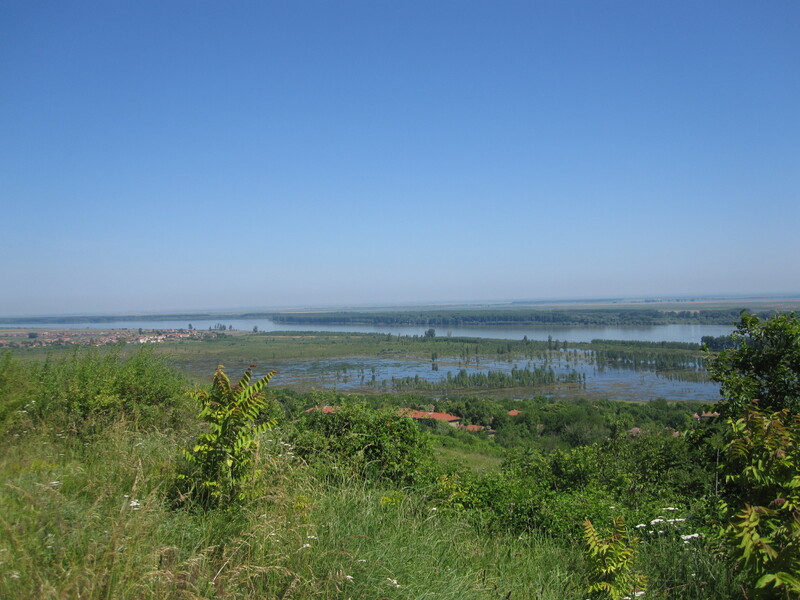 Lom was the one place where we saw any evidence of flooding from the recent heavy rain in Serbia. The riverside park had been recently under water and one of the landing stages had been damaged. The river here was lined by fishermen in the evening, and there were also some barges unloading at the quay. Another city where the evening activity for everyone seemed to be walking up and down the main street and through the huge communist era square. These squares were quite typical of many places we passed through, both in Bulgaria and Romania. 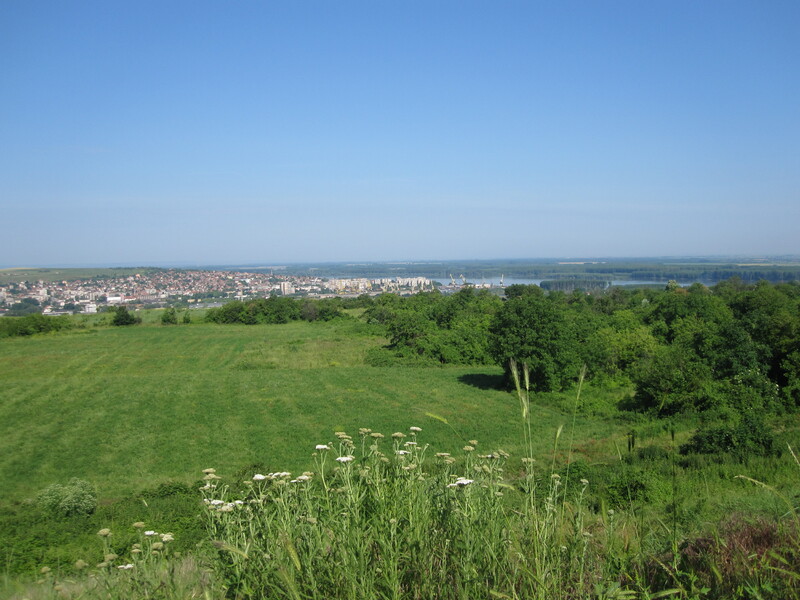 We left Lom and almost immediately began to climb onto a low ridge which ran parallel to the Danube. At first we feared that the cobbled road which ran through two villages would continue but mercifully it changed to a better, if still not good, surface. 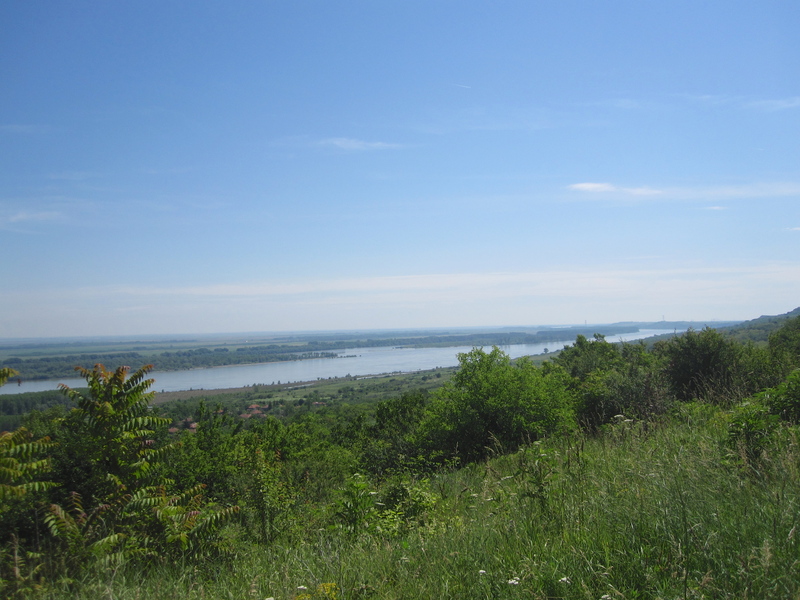 Our reward was magnificent views north and south along the river and across to the flatlands of southern Romania. Looking upstream – the floodplain was clearly doing its job. We did find lunch in a small town, but as so often the cafe was hidden off to the side of a sterile square. 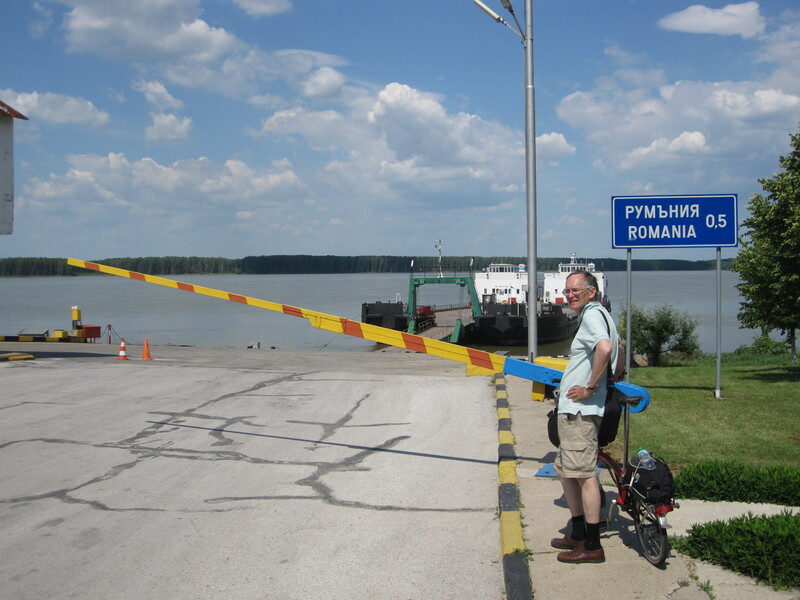 We crossed back to Romania on a (relatively) small ferry with a (relatively) relaxed passport and Customs operation. The sign says Romania 0.5km – across the water, that is. The sun was baking and the metal deck of the ferry was hot enough to cook on, I’m sure. A kilometre or so from the ferry landing in Romania we found good, motel style, accommodation in Bechet. Some evidence here too of EU money going in for both tourist and drainage infrastructure. The accommodation staff seemed to find the notion of guests a little surprising but they rallied to the situation and produced an excellent dinner and the usual omelette and salad for breakfast. 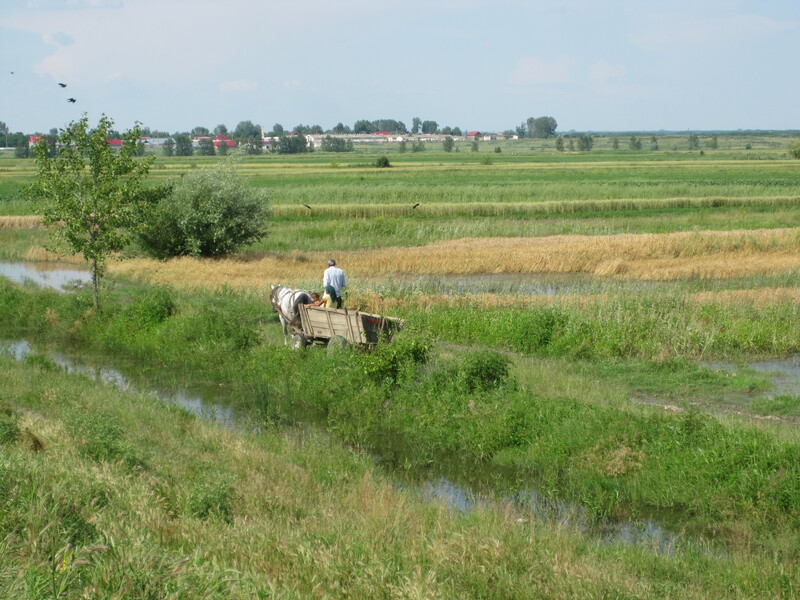 The most usual form of agricultural transport throughout those parts of Romania and Serbia that we visited. Almost always the 4-wheel carts had rubber tyres – we saw one with wooden/iron wheels- and usually one brown horse (the one above is unusual), sometimes two, or one or two donkeys. Often the whole family was on the seat, or an old couple. This entry was posted on July 16, 2014 at 1:55 pm and is filed under Out and About. You can follow any responses to this entry through the RSS 2.0 feed. Both comments and pings are currently closed.